Researchers at the University of Michigan Kellogg Eye Center have developed a new nanoparticle that uses a tumor cell's protective mechanism against itself -- short-circuiting tumor cell metabolism and killing tumor cells. Disruption of the tumor cell due to treatment with nanoparticles and visible light. "Our work uses a semiconducting nanoparticle with an attached platinum electrode to drive the synthesis of an anti-cancer compound when illuminated by light," says Howard R. Petty, Ph.D., professor of ophthalmology and visual sciences and of microbiology and immunology. "The nanoparticle mimics the behavior of NADPH oxidase, an enzyme used by immune cells to kill tumor cells and infectious agents. Since tumor cells typically use NADPH to protect themselves from toxins, the more NADPH they synthesize for protection, the faster they die." In a four-year study conducted on the mouse model in advanced breast cancer metastasis in the eye's anterior chamber, Petty and colleagues found that the new nanoparticle not only killed tumor cells in the eye, but also extended the survival of experimental mice bearing 4T1 tumors, a cell line that is extremely difficult to kill. "Previous monotherapies have not extended the lifetimes of mice bearing this type of tumor," Petty said. "Our work has shown that we can extend survival of the mice." The findings of the Kellogg team are detailed in a new paper published in Nanotechnology on Feb. 19. Joining Petty as co-authors of the paper are research associate Andrea J. Clark, and undergraduates Emma L. Coury and Alexandra M. Meilhac. "This treatment offers many advantages," Petty says. 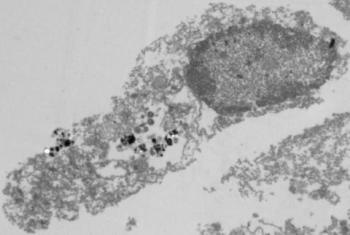 "The nanoparticle produces about 20 million toxins per hour in each cell. Also, the nanoparticle is activated by light, so it can be turned on and off simply by exposing it to the correct color of visible light." This nanotechnology also has the potential to be used for multiple applications in ophthalmology and other disciplines.